Young people save by sharing, dream of owning real estate and are enduring financial hardship. The sharing economy is very popular with young people. There are economic and ideological reason for this – a sustainable use of resources is an important concern of the Millennials. The sharing economy is one focal point of the 2018 Credit Suisse Youth Barometer. Among respondents, this economic model is quite popular, earning a grade of between 6.7 and 7.1 out of 10. What drives its popularity? One driver of the sharing economy could be the strained financial situation of young people today. The assertions "Sharing saves money" and "By sharing, I can buy things that I would not have otherwise been able to afford" garner strong agreement – this fundamental concept has already been seen in the shared apartments of the '70s, and now technology makes it feasible for a wide variety of goods to be easily and safely shared with strangers – things like bicycles, vacation rentals of all sizes, jobs, loans (crowdfunding) and cars. "Millennials have grown up in close contact with technology, and the idea of ‘shared content’ is familiar to them," says Giulia Ranzini, an expert on youth and the sharing economy at the Free University of Amsterdam. "So they take a fundamentally different approach to ownership." She adds that the idea of owning digital music, for example, seems absurd to a 19-year-old. Interestingly, though, the concept of sharing has by no means replaced ownership as a status symbol. The majority of young people still want to keep valuable things for themselves. Sharing ultimately offers more options. But the desire to accumulate wealth is still very important to this generation. A classic element of the Youth Barometer is to ask survey participants what they would do if given a large amount of money. 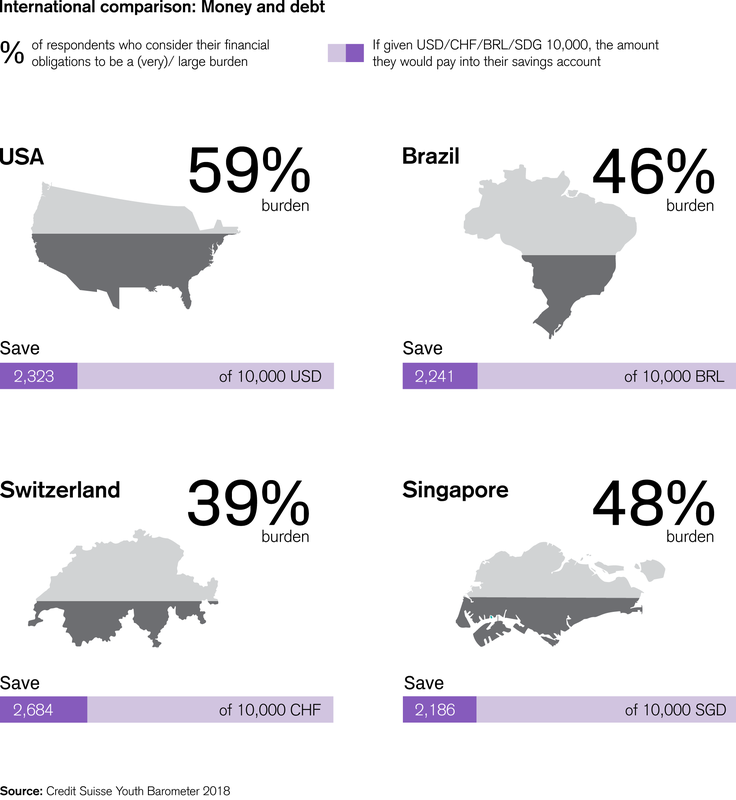 Fitting the image of the new, earnest youth of today, respondents in all countries would deposit around one quarter of the money into a savings account, with the most in Switzerland (27 percent). Another 10 percent of the money would be saved for a rainy day and yet another 10 percent for buying a house. In addition to smaller amounts spent on vacations or cars than in years past, this is the first year that young people would invest part of the money in cryptocurrencies. Further statements regarding financial matters serve to further solidify the image of a conscientious generation. The vast majority want to own a home: 84 percent in Switzerland, 90 percent in the US, 94 percent in Brazil and 92 percent in Singapore. Equities seem to be a favored investment vehicle in order to reach this goal. Around a quarter of those surveyed also viewed charitable donations as a high priority. In a way, one might get the impression that the young people in this survey were living a sort of "youth without childhood." The situation on the labor market is rough, and, when it comes to money matters, practicality and scarcity rule the day. Around half of the young people with financial obligations such as mortgages feel that these are a burden (59 percent in the US, 46 percent in Brazil and 48 percent in Singapore). In Switzerland, that group accounts for 39 percent.